Ouzo is a strong alcoholic beverage native to Greece that is distilled from the remnants of grapes that have been pressed for wine. Known for its distinctive licorice flavor and its potency, ouzo is served as a chilled drink and used in many recipes. Traditionally, this drink that is 40% alcohol is served “neat” (without ice) and if it needs to be cut because of its strength it is done with water. When water is added to it, it turns a milky white, and long-time drinkers will advise you to continually add water to your glass as you drink it. Although you want it to be served ideally at a cold temperature, adding ice causes crystals to form on the surface, and using any other mixers is going to cause you to get snubbed by regular ouzo drinkers. Ouzo is a beverage that is sometimes not distilled. This means that ingredients are put into the bottle together and allowed to naturally combine. There is an ancient method of distillation that many companies use which requires cooking the ingredients before placing them in the bottle, and does not add sugar in the recipe. Some of the spices use to flavor ouzo are mint, mastic, and coriander, but the most used is anise. Anise is a plant native to the region that has been used for centuries. 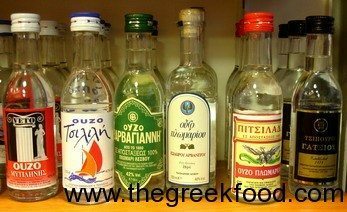 Countries around the Mediterranean use anise to flavor alcoholic drinks, but ouzo is specific to Greece and should not be confused with drinks similar to it, such as sambuca, absinthe, rakia or raki. Some people believe that anise has healing properties that can help with an upset stomach, or a headache. Like parents in other countries use other local alcohols, some Greeks will rub anise or a bit of ouzo on the gums of a teeth baby in order to ease the pain. Some of the brands that are well known and available outside of Greece include Ouzo 12, Sans Rival, Ouzo Barbayianni, and Ouzo Mini. 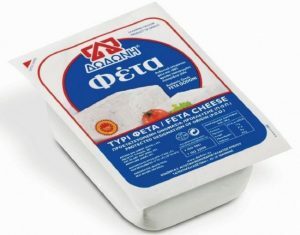 Brands available only in Greece but are greatly enjoyed include all different types from the area of Plomari, Tinarvou, and Kefi. One of the best known areas throughout the country for ouzo production is Lesvos, and it is the region which produces the majority of these brands. At one extreme, Ouzo Mini, is considered “mild and smooth” and is very popular around the country. Barbayannis is on the other end, with the strongest alcohol content, but is considered the “most popular” of Plomari Ouzo. Mezedes are small snacks that are served with the drink in cafes (called ouzaris) that help keep the strong alcohol from overwhelming a drinker. Each café has its own special-of-the-day that is served and it can be anything from local vegetables, breads, meatballs, cheese, sausage, fried fish, stew, or beans. Like appetizers or tapas, they are not entire meals by themselves, but are numerous and delicious – going well with the alcohol and the atmosphere. he chemistry of ouzo is heavy in sugar, which delays the alcohol from being absorbed into a person’s system right away or all at once. Therefore, over time the drinker feels the effects more strongly, so eating is a good way to counterbalance that. Especially foods which are low in sugar and will help your system digest the alcohol more readily and at an even pace of absorption. It is common to order mezdes at the same time you order your first glass, but spend many hours nursing both. And of course , you should try several different mezedes for the real experience while enjoying your ouzo. – Combine chopped garlic, tomatoes, clam juice, oregano, thyme, red pepper, and capers in hot olive oil. Reduce by half over heat. – Saute shrimp in butter over high heat. After removing the pan from heat, add ouzo, then return to the heat and carefully shake to ignite alcohol. – Serve to taste, removed from the heat. You shouldn’t cook the shrimp fully. – In a casserole combine the shrimp and the sauce, crumble feta over it, and bake until shrimp are cooked. 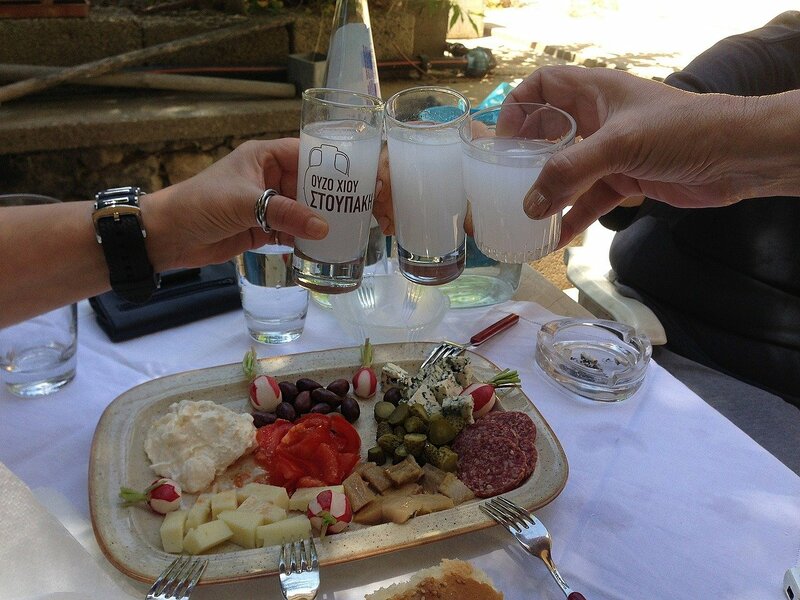 Anyone who visits Greece will experience ouzo on their trip, no matter where they go. Some say their desire for it wanes when they return home, but others find it a drink that becomes a life-long favorite. Rich and strong both in flavor and in punch, ouzo is one indispensable item in Greek cuisine. It makes every gathering more pleasant, and as long as there has been Greece herself, it has been a focal point of the Greek way of life.